Fake sentiment: I thought it made for a nice sentiment the first time I saw a college basketball team wearing T-shirts that read “Family.” But then I realized that these were Nike creations handed out to all of the company’s intercollegiate business partners. “Family” was simply another corporate scheme. Should have known. Nothing in big-time sports is organic. I think that the phrase, “intercollegiate business partners,” is quite telling. Joe Patrice sees eerie similarities between Donald Trump and the New England Patriots. In the lead up to the Super Bowl (which I shall honor by watching a mystery show or two*), Peter Certo points out that those who bemoan the “politicization” of pro football conveniently forget who promulgated said politicization. But it wasn’t the “social justice warriors” who politicized football. 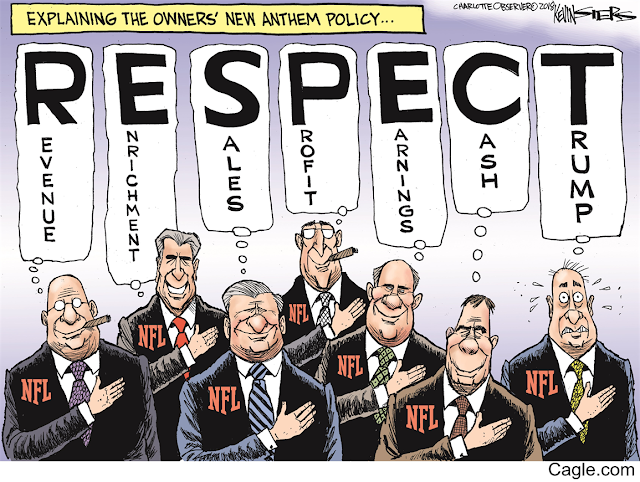 In fact, professional football has been deeply politicized for years. Maybe you didn’t notice before Colin Kaepernick took a knee, but the fact that one guy on one knee sparked a national firestorm highlights the politics of the stage on which he acted. *I’m not sure what turned me off first: the blatant corruption of the NCAA or the brutality (think CTE) of the NFL. Whichever it may be, I can no longer enjoy watching large men run into each other at high speed. This news item appeared before the holidays, but I can’t fail to mention that retiring Ohio State football coach Urban Meyer will stick around campus to teach a course titled “Leadership and Character.” Some jokes write themselves. Justice Kavanaugh must be cheering in the stands. I remarked to someone the other day that there is only one hope for the Washington Redskins, who have fallen far since their glory days under Coach Joe Gibbs and owner Jack Kemp Cooke. They need to trade for a new owner. Jack Kent Cooke was a class act. When he wanted a new arena for the Washington Bullets (now the Wizards), he didn’t come begging to local governments for taxpayer money. No, he just built it. H/T to Walden for correcting my hazy recollection. See the comments. Joe Patrice is amazed the Urban Meyer keeps getting away with it. ESPN’s turning the Little League World Series into a television spectacle is a vile and despicable act of exploitation. Ask me nicely, and I’ll tell you what I really think. Today, yet another article appeared in my local rag wondering where, amid declining attendance and TV ratings,* NASCAR is heading. Some persons blame the younger drivers for not having “star quality” (whatever that is), while those younger drivers charge the tracks with being outmoded and old-fashioned (whatever that means for an asphalt oval). Others argue that NASCAR should reach out to minorities, somehow not grasping that the sea of Confederate flags in a typical NASCAR track’s parking lot renders that notion somewhat beyond ludicrous. This particular article focused on the Commissioner, the grandson of NASCAR’s founder, and his seeming lack of interest in proselytizing for the sport. No one, of course, mentions that NASCAR race cars long ceased to be “stock cars” in any sense of the word. And no one has mentioned the underlying cause. Young folks these days are just not into cars. They don’t customize cars or models of cars; they don’t take them apart and repair them; they don’t buy broken down old heaps with a gleam in their eye to make them run and soup them up. I got a dollar to a doughnut that they don’t subscribe to Motor Trend or Sports Car Graphic (which I think is no longer with us), as I did when I was a teen. Also, in an extra-special bonus, twits who feel the burn. The Save America’s Pastime Act is a distorted label for the language that exempts pro baseball from federal labor laws. The waiver of minimum wage and overtime provisions for blue-collar ballplayers saves nothing more than what amounts to chump change for an industry flush with record revenues. Yes, big leaguers long ago became millionaires*, but the overall pay scale of the game is feudal. Minor-league players are paid by their major league parent club, not the affiliate whose uniform they wear. MLB contends that, if forced to pay minor-leaguers a salary that would equate to at least the minimum hourly wage, the minor-league teams would need to contribute to the payroll, which could put some farm teams out of business. *And most team owners are billionaires.